Doctorcall offers a wide range of STI Home Testing Kits which allow you to test for the most common sexually transmitted infections and diseases at a time and place that suits you. 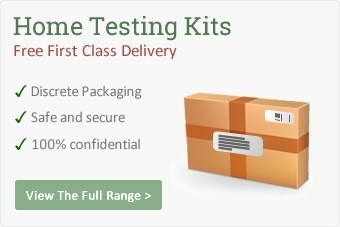 Our home testing kits are produced to the highest standard meaning you can be sure of quality. When you order a home testing kit from Doctorcall, we will ensure privacy and discretion. The small packet is delivered in a discrete, unmarked envelope that easily fits through your letter box. There's no need to visit a clinic or talk to anyone on the phone to get tested. Depending on the test you want, most STI Home Testing Kits require either a small urine sample or a tiny blood sample obtained by a finger prick. All of the equipment you need to take the sample is provided as well as return envelopes. Our lab will rapidly analyse your sample and get the results to you within a few days. Our range of Home Testing Kits are designed to give you the reassurance you want. Some of the most common STIs are Chlamydia, Gonorrhoea, HIV and Syphallis. We have designed a Home Testing Kit that can detect if you have any of these. Delivered in plain, discrete packaging. Fits easily through your letter box. Tests for the most common STIs. Once you make the decision to take a medical test, for whatever purpose or concern, it is essential that the test you choose provides accurate, reliable and reproducible results. Our HIV tests are 4th generation ELISA tests and sensitive nucleic acid amplification techniques are utilized in our STD testing panels. Many of these tests are not commonly available to NHS patients, such as the PCR based detection of Mycoplasma Genitalium and Trichomonas. Here at Doctorcall, all of our tests are processed by the largest, private CPA-accredited laboratory in Europe and our clinical practices are regulated by the Care Quality Commission - a public body in the UK Department of Health. The laboratory employs some of the most trusted and well known platforms in its analysis, including Roche, Abbott, Vidas, BD as well as several in-house multiplex PCR techniques. We are regulated by the Care Quality Commission and our testing lab is CPA-accredited.